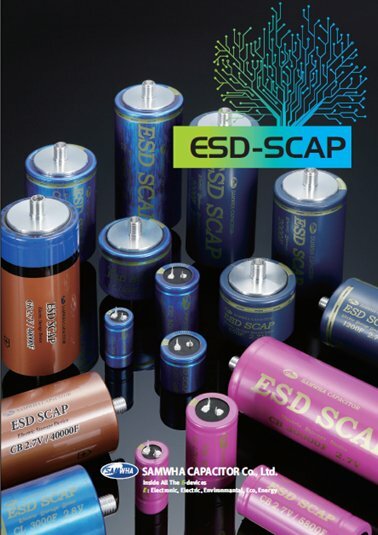 Samwha ESD-SCAP promises energy storage devices positioned between a conventional EDLC and Li-ion battery. Due to its high energy, high power and log-term reliability of the hybrid capacitors and battery capacitors, the component can be used in numerous applications. In order to meet consumer demand for both high energy and power density with greater efficiency and functionality, Samwha has been focusing on the R&D of battery capacitors. A battery-capacitor (CB series) is one of the most advanced energy storage devices and is representative of the energy storage technology based on a lithium ion battery and super capacitor hybrid system. It utilizes the negative LTO electrode and the positive Lithium transition metal oxide electrode employing Li+ intercalation-deintercalation process.